Grace Temple Christian Academy has changed our number. Please make note of our new phone number, 361-289-7770. We would like to thank everyone that came out and supported the students at the car wash last Saturday. For the last several weeks we have been raising money for a new full sized, concrete basketball court. Our goal has been to raise about $6,000.00, and with your help last Saturday we were $600.00 closer to our goal. We thank you for all of your support and look forward to what the Lord has in store for GTCA. Glad Tidings Christian Academy was scheduled to have a car wash to help raise funds to build a new Basketball court on September 3rd. However; due to the threat of inclement weather moving in, we have decided it would be best to reschedule the event. GTCA is grateful to Cynthia Willeford for honoring her late husband, Mr. Al Willeford through the Al Willeford Memorial Scholarship. As a vital member of Assembly of God for over 25 years, there was no doubt he loved, "his" church. Brother Al was a generous man of honor, and integrity and he cared for the youth of Glad Tidings. It is because of his generosity that he is still investing in the lives of young people through this scholarship. 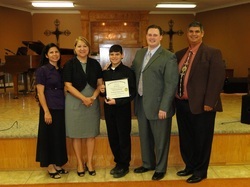 It is with great honor that we congratulate Benjamin Perez as the first recipient of this full tuition scholarship. 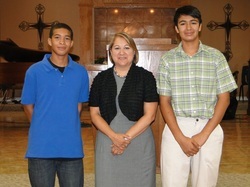 We would also like to extend our thanks to Cynthia Willeford for extending the scholarship to include a partial tuition scholarship to Daniel Garcia and John Mills. The GTCA School Calendar is now available for download. Click on the link below. GTCA is looking forward to celebrating our 10th year in ministry by being a new member of the T-CAL organization. We will be posting a basketball schedule as soon as dates and times are confirmed. Al Willeford was a longtime member of Glad Tidings Assembly of God Church and Glad Tidings Christian Academy School Board. He was a local business owner, decorated Military Veteran, and an example of integrity and honor. It is our honor to present the Al Willeford Memorial Scholarship. This is a Scholarship open to all students attending Glad Tidings Christian Academy. Please see our Admission tab for downloadable information. Parents of current Students need to turn in re-enrollment forms as soon as possible to secure a place for the 2011-2012 school year. need-based tuition assistance program by visiting our Admissions Tab. GTCA would like to thank Brother Tom and Sister Alethea Doud for their assistance with the construction of Banquet props and decorations. We would also like to thank all the parents that helped cater and set up for this annual event. Your hard work is appreciated! We are gearing up for a new school year and we are moving into new facilities. Currently renovations are taking place and we are needing some assistance. If you would like to help us in any way, please contact Ray or Cindy at 361-289-1261 or email: cperez@gtcacademy.com for more information.